Learning Spanish can be very hard. It is a very difficult language and it may stress you out at times. However, I came to learn it in Madrid and I could not be more delighted. My name is Paul. I am Scottish, more specifically from the city of Perth. 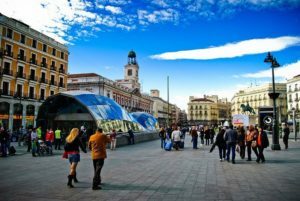 It is a city of about 40,000 inhabitants and I decided to change my life completely by coming to Madrid and learning Spanish. I thought it was going to be difficult and that I would struggle to adapt. But the truth is, everything is going great! I’ll tell you how my first two incredible weeks have gone. I came to Madrid with a host family. This process could not have been made any easier on their part. They are very attentive, friendly and are constantly helping me in anything I need. As soon as I arrived I had my room ready, they all showed up, they showed me the house, they gave me the wifi password, a map of Madrid, they told me the meal schedule, and what we would eat during the week. I was with them watching TV in the living room and I was ready to start learning Spanish. I was already one more member of their family! My schedule is made up of Spanish school in the mornings for 3 hours all week and an open schedule the rest of the time. So, what do I do the during my time off? ENJOY! Madrid is an amazing city! Being accustomed to my small town, this was a radical change for me, a world of possibilities. 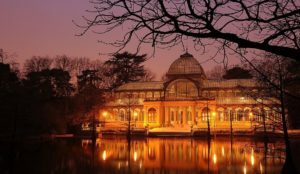 Everything you think you’d like to do, you can do while learning Spanish in Madrid. I, however, have some preferences. 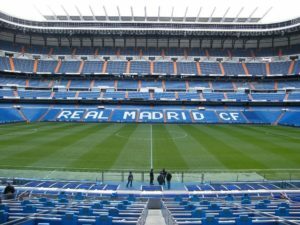 I am a big soccer fan and Madrid, in recent years, has been the capital of soccer since both Real Madrid and Atletico Madrid have reached two Champion League finals. The first thing I did while I was in Madrid was go see their stadiums. The truth is that I loved both, but the Santiago Bernabéu was another level of awesome. It gave me goosebumps. You could breathe soccer in the air. I did the stadium tour and it was spectacular. The two places where the fans celebrate their titles: la Cibeles and Neptune. 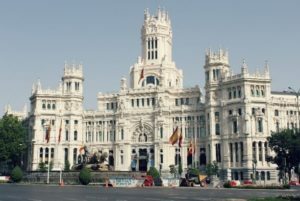 In addition to that, I saw the fabulous building that is the Ayuntamiento de Madrid, I walked through the Plaza de la Castellana and began to move more freely on the metro. The truth is that the people here are very friendly. Anyone you ask does not hesitate to help you and resolve any doubts you may have. I made friends at school. We spoke in Spanish and we all wanted to see every corner of Madrid, so we started planning where to go for the weekend. We decided to go to the center of Madrid, as there were many tourist sites there. This would allow us to make a quick visit to all the sites and know where each one is. On another day we could come back to see them in more detail. The center of Madrid, in case you do not know, is Puerta del Sol. There is a wonderful atmosphere there. Lots of people in the area, people playing different instruments, shows in the middle of the street, lots of shops, restaurants, and many places to visit, of course. Among them, the main square, Plaza de España, Callao, the Royal Palace, Mercardo de San Miguel, Templo de Debod … You could visit sites all day long. I knew learning Spanish would be easy if I enjoyed my time in Madrid. It has been a great experience so far! During my second week learning Spanish in Madrid, I visited other places with my friends and with my host family. My host family wanted me to see more rare places that young people like me do not usually know of. 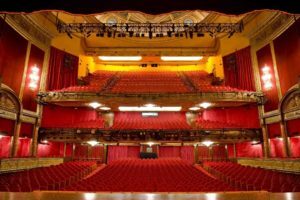 This includes more cultured sites like museums and theaters … the truth is that those sites left me fascinated. 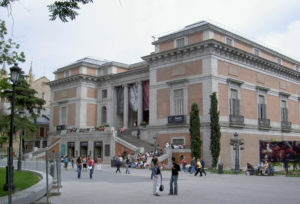 First my host family and I went to visit the Prado Museum. The number of artistic works in this one place is amazing. I did not imagine it to be so big. It took us hours to see it all despite us not seeing it in full detail. A few days later we went to the theater Lope de Vega, where the Lion King was showing. I was left speechless. Decor, actors, songs … everything was kept to the last detail. Both experiences were very useful as I tried to learn Spanish, especially to improve my Spanish hearing. Once the week passed, I made plans with my classmates to go spend our Saturday at Parque Retiro. When you go to a place, you look for information about it. But one thing is to see it online and another very different to visit it. I did not imagine that a park could be so big, have so many secret corners, a lake for a boat ride, bars, and s o much more! My favorite part, without a doubt, was the beauty of the Crystal Palace. It was great and I came home with the idea of ​​returning very soon. I was able to achieve all of this thanks to MyHOSTpitality, who offered me all kinds of help. When looking for my host family MyHOSTpitality came in very handy. They have their own community through which I talked to different host families until I found the one that best suited my interests. In addition, they were very attentive throughout the process in case any unforeseen events arose. I used the guest option, but there are other alternatives like the language exchange or host. All of this was at a much lower price than I expected thanks to the collaborative economy on which this company operates. The truth is that I undoubtedly recommend MyHOSTpitlity. Thanks to them I am living and enjoying my time in Madrid as I am learning Spanish in a way I would never have imagined. For more information, you can email them at info@myhostpitality.com. Do not hesitate to start your own adventure like I did! How to learn Spanish while studying at a university in Madrid!